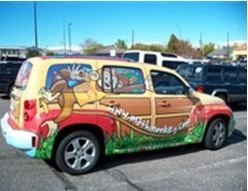 We’ve all seen cars or buses with eye-catching designs splayed across them advertising some sort of product or service. 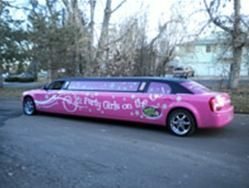 And the reason we’ve all seen them is because being in a highly mobile, visible society means that this type of advertising, known as a vehicle wrap, is proven to work! They are hard to miss because they demand attention. With the right use of colors, images and typography, the possibilities are endless when using vehicle wraps to get your message to the masses. Digital printing has changed the way we advertise. Whereas signs and graphics used to be drawn by hand in paint, digital vinyl printing and wrap installers can make full or partial wraps in just a few hours. As seen on buses and cars, wraps can be cut for door openings and are usually placed near the rear of the vehicle to still allow for driver visibility.They are very safe for drivers of the vehicle when properly installed. But if you are the driver of a different vehicle, and are gawking at the amazing wrap, be sure you are not too distracted to drive and end up crashing! Vehicle wraps can be a great tool to attract new customers and to remind old ones of how awesome a company is. They can be used to show and tell all about a new product or service. With the lasting potential of five to seven years depending on location and care, vehicle wraps are an investment with great return. 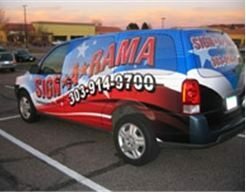 Vehicle wraps could be the creative branding and advertising tool that is paramount to the success of your business.